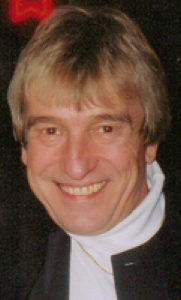 Gordy William Price, 60, 117 Magnolia St., Celina, Ohio formerly of Sidney, Ohio died at his residence on Sunday, August 23, 2009. He was born June 13, 1949 in Sidney, Ohio the son of Donald Jack and Roselyn (Ross) Price and they preceded him in death. He is survived by two children, Gordy Price II and wife Jamie of Chicago, Illinois and Shea Jutras of Columbus, Ohio; two brothers, Ross Price of Daytona Beach, Florida and Don Price of Sidney, Ohio and one sister, Mary Price of Sidney, Ohio. He was a 1967 graduate of Sidney High School and a 1971 graduate of Urbana College, Urbana, Ohio. He was a psychology major. Mr. Price was a very popular radio star in the Sidney area for years. He had worked at WMVR Radio in Sidney and also for Channel 13. He introduced the country music stars at the Country Councert in Newport, Ohio for years and was an emcee for the popular country music festival. He had the honor of introducing President Ronald Reagan in 1984 when Reagan visited Sidney. Price had also worked at Dayton WING with Steve Kirk and for ABC News in Chicago with Mark Giangreco. Also worked at T102 in Lima, Ohio and Bellefontaine radio station WTOO and had worked at WIMT-FM radio in Lima for 20 years. Through the years, Price earned a reputation for his good-natured on-air patter and a genuine enthusiasm for his listeners. Price had socred some of the region&#39;s highest radio ratings. A Mass of Christian Burial will be held on Friday, August 28, 2009 at 10:30 AM with Rev. Dan Schmitmeyer. Burial will be at Graceland Cemetery, Sidney, Ohio. Friends may call at Salm-McGill and Tangeman Funeral Home in Sidney on Thursday, August 27, 2009 from 3-9 PM. Memorial contributions may be made to Lehman High School, Music Program, 2400 St. Mary&#39;s Ave., Sidney, Ohio 45365. Envelopes will also be available at the funeral home.